A neighbor of mine recommended this Turkish towel and I couldn't be more pleased with my choice! It washes well, dries quick, works great as a bath towel, a beach towel or a wrap when your cold! The colors are as pictured and it doesn't fad or unravel like a lot of products out there. The weight is medium and its soft enough to use the towel on the most delicate of skin! I'm going to order more for our beach house! Luxurious and exotic, this towel will add comfort and convenience to your bath time. The authentic pestemal, a flat-woven authentic Turkish bath towel, is made from 100-percent Turkish cotton and is embellished with hand-tied fringe. The oversized towel is light and easy to care for. The quick drying towel requires less water, detergent, and energy when washing. This Turkish towel can be used as an impromptu picnic blanket, or it can be worn as a sarong, scarf, or skirt while at the beach or pool. The striking colors and traditional construction will make this towel the perfect accessory for your bathroom or beach day. At first I wasn't sure but after I washed it, it became super absorbent, plus, it dries quickly. I thought these would be a better alternative to heavy terry cloth towels that take too long to dry and are bulky. They do work better for me because it's hot in my bathroom after a hot shower and these don't make it hotter. They are easier to store as well. They do wrinkle up if you don't take them out of the dryer right away but that doesn't matter to me - they dry pretty quickly and aren't has hard on my washer/dryer. I have a few other Turkish towels and after I washed these noticed they felt much thicker than my others. I really like these and am considering buying more! I have never seen nor had a towel like this. Not at all what I expected! It reminds me very much of a large dish towel, before it's washed: stiff and rough. It's very thin as well. I read that it had fringe, but I wasn't thinking that it would be knotted fringe. I won't be using it as a beach towel bc I think it's too thin for that purpose. I guess it will work as a bath towel when we are out of others. Overall, it's not one of my smartest purchases. I wouldn't order it again. Took A Bath on these Towels!!! I love this. It feels thicker and definitely has more weight to it than the other Turkish towels we’ve purchased. It dries relatively quickly compared to terry towels. I’d definitely buy again in another color. Love these towels. They are great to carry while traveling or to use at home as towels, small blanket or shawl. I have several colors. Keeps color and is very easily washed and dries quickly. I originally purchased three different towels and this one is my favorite. Gets softer with each washing and is very absorbent. I use it in my small bathroom, vs beach. I wanted something that dried quickly and this does the trick. This is my second time ordering these towels. Inexpensive and everyone loves them! These are a gift, and they seem nice, but not quite as thick as some of the pestemals i have purchased in the past. They should still work great though. Love them great on our boat. Terrible. They don’t dry you at all. I just received these beautiful towels. They are soft and very good size. Great for the beach, shower or just hanging around as a wrap. Great price and fast shipping. I like the large size of the towel, and the price is affordable. 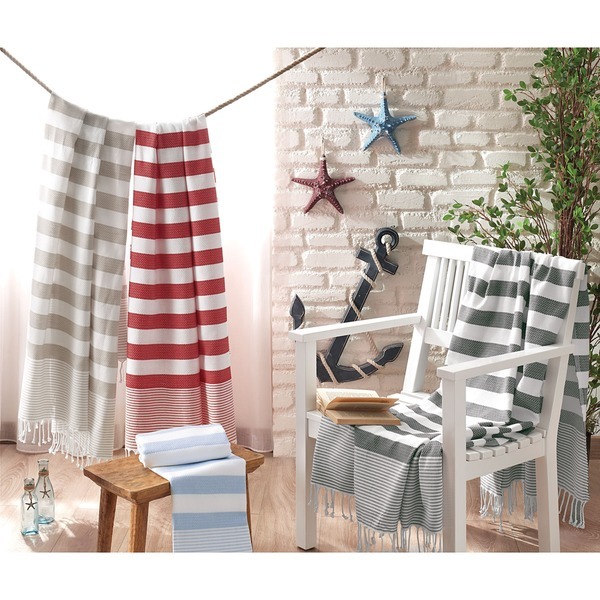 I want to try the all cotton "Turkish towel" as opposed to the fluffy beach towel I have which does not absorb water or help one dry off at all. Also: cool as a sarong. Pool-side towels for guests. Expect them to be perfect weight for quick drying and easy coverup. Not expecting, nor do I want, thick and plush.